The greatest example of courage is what Jesus Christ modeled for us. To lay down ones life for another. Sacrifice, the denial of self. As Jesus talks about His life purpose I realize this is the calling, everything centers here. All of the mysteries of life find its purpose here in one laying down their life for another. 24 Very truly I tell you, unless a kernel of wheat falls to the ground and dies, it remains only a single seed. But if it dies, it produces many seeds. Think about this, when you plant a seed, it actually dies before it produces life. This is the ministry and call of Jesus and from Him to us. 39 Whoever finds their life will lose it, and whoever loses their life for my sake will find it. This apply s to everything, think about when you get discouraged or feel like a failure and you have internal battles in your heart about what is right and what is wrong, and what you should do to change the results of your choices.Those feeling are connected to the flesh by the spirit producing conviction. The spirit knows it ‘s goal and will work on your heart until you submit to the spirit. The flesh desires pride and ownership of our hearts. the flesh wants to be first, the flesh is selfish, self righteous, greedy. The lust of self-will. The path of holiness is found by offering your life to Christ. allowing the spiritual seed of your body to die so that it will find it’s life in Christ. One day our physical bodies will die and if we die in Christ He says the dead seed of our bodies will produce life eternal. The seed of a sinful mans body glorified by God in death. Flesh and spirit do not go together, one must replace the other. The flesh must die for the spirit to live. This is what Jesus modeled. This is why we love and respect Him above anything else. An all powerful King of the universe humbled himself, died to Himself, came to earth as a defenseless baby, so that we would know how wide, how deep His love is for us! Courage, His name is Courage, and I pray this very morning that we together will find courage to walk in love, dieing to ourselves that we might find life! May the Lord fill your spirit with truth and your heart with divine love. May He stamp your heart with courage. Truer words were never spoken, Brother Ken! Most people don’t realize that true, agape, Godly Love is only possible when self is set aside, just as you posted. Selfishness, is the REAL opposite of love. The enemy would have us believe that love and hate (the emotions, not actions) are real, when in essence, if you are selfish, you don’t have the capacity for the potential to love. James said it right when he stated, not to love in words only (words by themselves are empty) but in deed and in Truth!! That my Brother takes the very courage that you have brought out in the Scriptures and your exhortation!!! Great AND timely post my brother!! God bless you so very much indeed!!! Praise Jesus for our ability (through Him) to be courageous!! Your comments are very humbling indeed for I am only a servant of our Lord, Christ Jesus. Thank you so much for your kind words. I love Brother Ken’s site and I can ALWAYS come here for inspiration from the Holy Spirit! 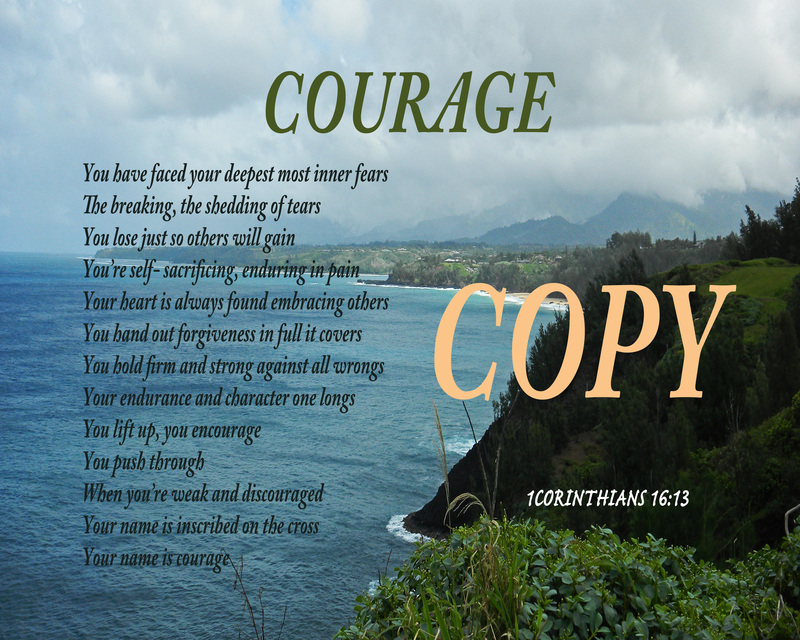 This post is so full of wonderful truths….I’ve never seen this take on the word courage…. I love this perspective. Thank you so much, and thanks for visiting!